Eric Good is the Director of Powell Wellness Center (PWC). He joined PWC in 2012. Eric holds a bachelor of science degree in health and fitness from George Mason University in Fairfax, VA, and an associate degree in science (physical therapy assistant program) from Jefferson College of Health Sciences in Roanoke, VA. Prior to joining PWC, Eric was Director at the Augusta Health Lifetime Fitness Center in Fishersville, VA, where he led the launch of a hospital-based medical fitness wellness center; spearheaded a construction and expansion project; and developed integrated services and wellness programs. Eric is passionate about health and wellness and enjoys any opportunity to help people achieve a greater fitness and a healthy lifestyle. Patrice Barklund is responsible for health and fitness programming that encourages healthy lifestyles and improved fitness outcomes for PWC members and the overall community. Patrice has been with PWC as a Group Fitness Instructor since 2007 and has served in her current role of Wellness Coordinator since 2013. She has many years of experience working in both fitness and health care settings. 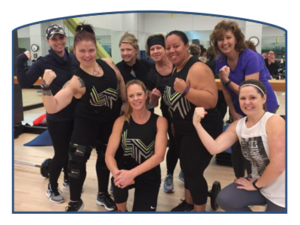 In addition to being an awesome Spin instructor, Patrice enjoys working with the fitness staff to offer group exercise classes that are fun for people of all ages. Josh Lemasters has been with the PWC team since May 2007. He has a bachelor of science degree in kinesiology and recreation studies from James Madison University in Harrisonburg, VA. Josh holds lifeguard instructor and water safety instructor certifications through the American Red Cross as well as a pool operator certification through the National Swimming Pool Foundation. Josh has more than 12 years of experience working in recreation and wellness centers in various capacities, such as park interpreter, lifeguard, swim instructor, and assistant manager roles. At PWC, he works tirelessly to ensure that the facility is running efficiently and that members have a great health and fitness experience. Whitney Propps joined PWC as the Medical Program Leader in 2018. She is responsible for FitScripts, our physician-referral program that supports the wellness needs of individuals with physical limitations or chronic conditions through specially designed, supervised exercise programs. Whitney also oversees the member fitness assessment program provided as a benefit of membership at PWC. Whitney is a graduate of Bridgewater College with a major in Health and Exercise and a minor in Nutrition and Wellness. She is also a certified aquatic instructor through the Aquatic Exercise Association.